On the morning of the 13th April, my alarm went off, as normal but at a silly time of the morning. Confused, I wondered why it was chirping at me, and then the adrenaline rushed through me as I remembered that it was the day to make my sprint distance debut. Once up and dressed, with my trusty back up team (my parents), we loaded up the car and prepared to drive to Cupar. Amidst many protests from my mum that it was too early for inspirational music (there’s absolutely nothing wrong with a wee bit of rave music at 7am), and “do we really need to hold the banner and shout EUTri?” we eventually got to Cupar. The weather was positively grim, with a pretty nippy wind blowing dust around transition, and thick cloud overhead. I probably definitely said “what am I even doing” and “aww nut” too many times. The many Triathlon Scotland officials walking around transition inspecting bikes didn’t exactly soothe me; this was going to be a pretty strict race! Registration was pretty efficient, after showing my race license I got my free water bottle, filled with a cereal bar, and a bag of haribo, yaas! I then came back out and set up my stuff in transition, trying to strategically find a good spot, whilst also eyeing up everyone else’s bikes and kit. Once happy that I’d sufficiently coated everything and everyone in my vicinity with enough talcum powder, I headed back to the car to try and stay warm. The rest of EUTri eventually arrived, putting my mind at ease that I wasn’t racing alone! The novice heats were first, giving me enough time to try and digest some food. Then it was the sprint heat before mine and I started to panic. All too soon, it was my turn though. I got into the pool, not realising how shallow the shallow end was and nearly broke my legs in the process… Once sufficiently recovered I then realised how warm the water was. It was the sort of temperature that you have a bath with, not swim 750m! The swim itself was fine, undoubtedly the best part of my race. Then after having nimbly jumped out the pool (who am I kidding, I rolled out like a beached whale), I jogged to transition to set out on the bike. The wind was ridiculous on the bike; I was cycling as hard as possible on the down hills but going nowhere fast. Every time a lorry went past I was struggling to stay in a straight line on the flats! It was the worst wind I’ve ever cycled in, even worse than the time trial at Silverknowes! Well over an hour later I eventually returned to transition, frozen to the bone, feeling absolutely raw, but pleased to be alive, and in one piece. My parents were cheering me on, with my mum taking lots of super flattering pictures, who knew you could look so good in a trisuit?! After having racked my bike and taken my helmet off, I ran out of transition, trying my best to ignore my body which was struggling after the cycle, and clearly absolutely did not want to run 5k. The 3 loops around the sports centre seemed like a daunting task; so near to finishing the race, yet so far! Half way around the first lap the tears nearly started to flow for the first time, I was absolutely exhausted and didn’t have much left to give! But I continued on. The marshals really got me through those laps, especially a woman with a cow bell, and another who was giving actually useful advice; “shoulders back, don’t clench your fists, head up!” My running technique must have been incredibly shoddy, even worse than normal! The guys from EUTri shouting at me also helped, and before I knew it, although not a moment too soon, I was approaching the finish line. I did my best to sprint the final 20m (always finish strongly!) and once over the line a nice lady quickly came and took my timing chip off. With my bottle of water and flyer for another race, I headed in the general direction of where the EUTri guys and my parents were standing. However, my tunnel vision was on and the only person I was focussed on was my mum; I reached her and collapsed into her arms crying and putting snot all over her new jacket. Awkward. Akib then hugged me and couldn’t tell me enough times, “But you’re finished, why are you crying? !” I’ve still got no idea why, I think it was relief. So my first sprint distance race concluded in a slightly horrendously embarrassing way, but I DID IT!! 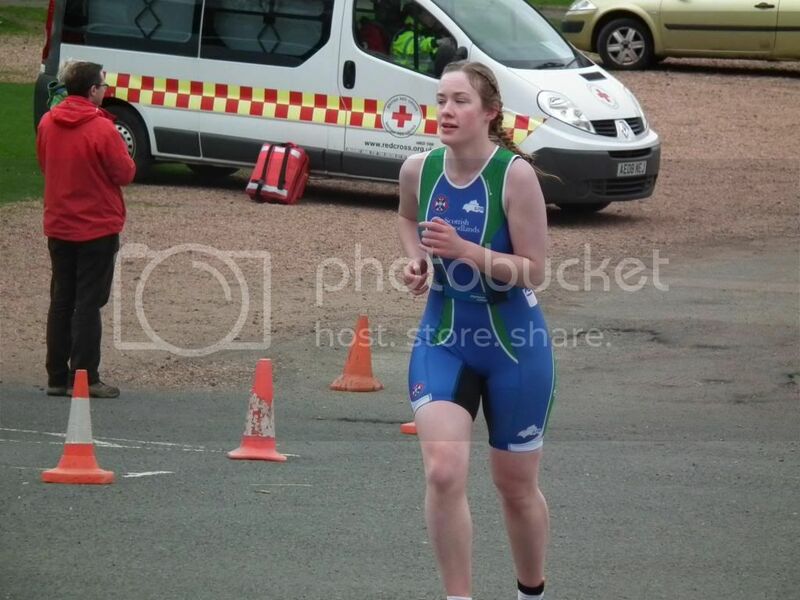 The girl at high school who was scared to run and do exercise in daylight for fear of being laughed at is now competing in sprint distance triathlons in skin tight lycra! None of my PE teachers would ever have predicted that! I may not have come first, but I did give it my all. One day I’m going to do Norseman. One day. President Forsyth, over and out!